April is National Autism Awareness Month and people and organizations around the world are raising awareness about a disorder that affects more than 20 million people globally. Autism affects early brain development and causes a wide spectrum of social, mental, physical and emotional symptoms that appear during childhood. Because the symptoms and their severity can vary extremely between people, scientists now use the classification of autism spectrum disorder (ASM). In celebration of Autism Awareness Month, we’re featuring an interview with a CIRM-funded scientist who is on the forefront of autism and ASD research. 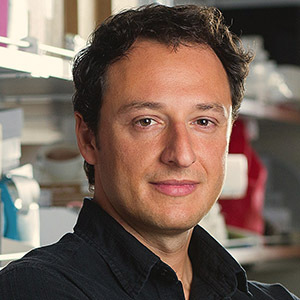 Dr. Alysson Muotri is a professor at UC San Diego and his lab is interested in unlocking the secrets to brain development by using molecular tools and stem cell models. One of his main research projects is on autism. Scientists in his lab are using induced pluripotent stem cells (iPSCs) derived from individuals with ASD to model the disease in a dish. From these stem cell models, his team is identifying genes that are associated with ASD and potential drugs that could be used to treat this disorder. Ultimately, Dr. Muotri’s goal is to pave a path for the development of personalized therapies for people with ASD. I reached out to Dr. Muotri to ask for an update on his Autism research. His responses are below. Q: Can you briefly summarize your lab’s work on Autism Spectrum Disorders? AM: As a neuroscientist studying autism, I was frustrated with the lack of a good experimental model to understand autism. All the previous models (animal, postmortem brain tissues, etc.) have serious experimental limitations. The inaccessibility of the human brain has blocked the progress of research on ASD for a long time. Cellular reprogramming allows us to transform easy-access cell types (such as skin, blood, dental pulp, etc.) into brain cells or even “mini-brains” in the lab. Because we can capture the entire genome of the person, we can recapitulate early stages of neurodevelopment of that same individual. This is crucial to study neurodevelopment disorders, such as ASD, because of the strong genetic factor underlying the pathology [the cause of a disease]. By comparing “mini-brains” between an ASD and neurotypical [non-ASD] groups, we can find anatomical and functional differences that might explain the clinical symptoms. Q: What types of tools and models are you using to study ASD? 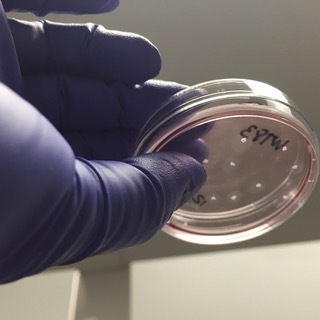 AM: Most of my lab takes advantage of reprogramming stem cells and genome editing techniques to generate 3D organoid models of ASD. We use the stem cells to create brain organoids, also called “mini-brains” in the lab. These mini-brains will develop from single cells and grow and mature in the same way as the fetal brain. Thus, we can learn about their structure and connectivity over time. A cross section of a cerebral organoid or mini-brain courtesy of Alysson Muotri. This new model brings something novel to the table: the ability to experimentally test specific hypotheses in a human background. For example, we can ask if a specific genetic variant is causal for an autistic individual. Thus, we can edit the genome of that autistic individual, fixing target mutations in these mini-brains and check if now the fixed mini-brains will develop any abnormalities seen in ASD. The ability to combine all these recent technologies to create a human experimental model of ASD in the lab is quite new and very exciting. As with any other model, there are limitations. For example, the mini-brains don’t have all the complexity and cell types seen in the developing human embryo/fetus. We also don’t know exactly if we are giving them the right and necessary environment (nutrients, growth factors, etc.) to mature. Nonetheless, the progress in this field is taking off quickly and it is all very promising. 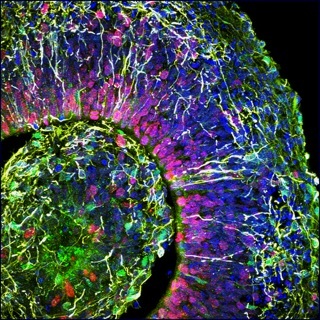 Two mini-brains grown in a culture dish send out cellular extensions to connect with each other. Neurons are in green and astrocytes are in pink. Image courtesy of Dr. Muotri. Q: We’ve previously written about your lab’s work on the Tooth Fairy Project and how you identified the TRPC6 gene. Can you share updates on this project and any new insights? AM: The Tooth Fairy Project was designed to collect dental pulp cells from ASD and control individuals in a non-invasive fashion (no need for skin biopsy or to draw blood). We used social media to connect with families and engage them in our research. It was so successful we have now hundreds of cells in the lab. We use this material to reprogram into stem cells and to sequence their DNA. One of the first ASD participants had a mutation in one copy of the TRPC6 gene, a novel ASD gene candidate. Everybody has two copies of this gene in the genome, but because of the mutation, this autistic kid has only one functional copy. 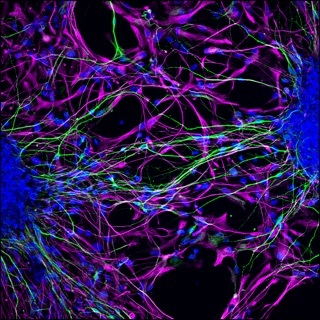 Using stem cells, we re-created cortical neurons from that individual and confirmed that this mutation inhibits the formation of excitatory synapses (connections required to propagate information). Interestingly, while studying TRPC6, we realized that a molecule found in Saint John’s Wort, hyperforin, could stimulate the functional TRPC6. Since the individual still has one functional TRPC6 gene copy, it seemed reasonable to test if hyperforin treatment could compensate the mutation on the other copy. It did. A treatment with hyperforin for only two weeks could revert the deficits on the neurons derived from that autistic boy. More exciting is the fact that the family agreed to incorporate St. John’s Wort on his diet. We have anecdotal evidence that this actually improved his social and emotional skills. To me, this is the first example of personalized treatment for ASD, starting with genome sequencing, detecting potential causative genetic mutations, performing cellular modeling in the lab, and moving into clinic. I believe that there are many other autistic cases where this approach could be used to find better treatments, even with off the counter medications. To me, that is the greatest insight. Watch Dr. Muotri’s Spotlight presentation about the Tooth Fairy Project and his work on autism. Q: Is any of the research you are currently doing in autism moving towards clinical trials? AM: IGF-1, or insulin growth factor-1, a drug we found promising for Rett syndrome and a subgroup of idiopathic [meaning its causes are spontaneous or unknown] ASD is now in clinical trials. Moreover, we just concluded a CIRM award on a large drug screening for ASD. The data is very promising, with several candidates. We have 14 drugs in the pipeline, some are repurposed drugs (initially designed for cancer, but might work for ASD). It will require additional pre-clinical studies before we start clinical trials. Q: What do you think the future of diagnosis and treatment will be for patients with ASD? AM: I am a big enthusiastic fan of personalized treatments for ASD. While we continue to search for a treatment that could help a large fraction of ASD people, we also recognized that some cases might be easier than others depending on their genetic profile. The idea of using stem cells to create “brain avatars” of ASD individuals in the lab is very exciting. We are also studying the possibility of using this approach as a future diagnostic tool for ASD. I can imagine every baby having their “brain avatar” analyses done in the lab, eventually pointing out “red flags” on the ones that failed to achieve neurodevelopment milestones. If we could capture these cases, way before the autism symptoms onset, we could initiate early treatments and therapies, increasing the chances for a better prognostic and clinical trajectory. None of these would be possible without stem cell research. Q: What other types of research is your lab doing? Mini-brains grown in a dish in Dr. Muotri’s lab. AM: My lab is also using these human mini-brains to test the impact of environmental factors in neurodevelopment. By exposing the mini-brains to certain agents, such as pollution particles, household chemicals, cosmetics or agrotoxic products [pesticides], we can measure the concentration that is likely to induce brain abnormalities (defects in neuronal migration, synaptogenesis, etc.). This toxicological test can complement or substitute for other commonly used analyses, such as animal models, that are not very humane or predictive of human biology. A nice example from my lab was when we used this approach to confirm the detrimental effect of the Zika virus on brain development. Not only did we show causation between the circulating Brazilian Zika virus and microcephaly [a birth defect that causes an abnormally small head], but our data also pointed towards a potential mechanism (we showed that the virus kills neural progenitor cells, reducing the thickness of the cortical layers in the brain). You can learn more about Dr. Muotri’s research on his lab’s website.